The International Union of Muslim Scholars is calling on Palestinians to "Rescue al-Aqsa" and rise up against Israel, according to several Twitter posts translated by the Investigative Project on Terrorism (IPT). "The International Union of Muslim Scholars requests the Ulema [Muslim community] and preachers of the Muslims to begin the campaign 'Rescue al Aqsa' and proclaim a state of general alarm among the sons of the Muslims in the world to defend al Aqsa mosque, and divulge the plans of the Zionists, and also to summon the Islamic Umma to hold protests, and to devote this Friday's sermons to discuss Jerusalem, Al-Aqsa and Palestine." 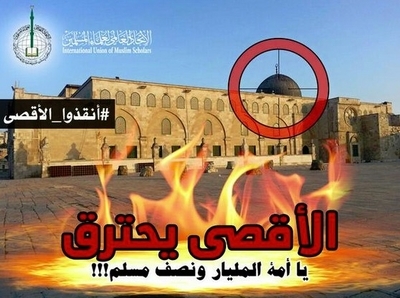 The hashtag #RescueAlAqsa is also included in a subsequent tweet featuring a picture of flames engulfing the al-Aqsa with a sniper's target fixated on the dome of the mosque. "Al-Aqsa is burning Oh Umma of a billion and a half Muslims!! !," reads the slogan on the provocative tweet. Meanwhile, Palestinian Authority President Mahmoud Abbas glorified Palestinians fighting Israelis in Jerusalem and called for Palestinians to prevent Jews from entering Al-Aqsa with "everything in our power," Palestinian Media Watch (PMW) reports. "The Al-Aqsa [Mosque] is ours... and they have no right to defile it with their filthy feet. We will not allow them to, and we will do everything in our power to protect Jerusalem... We bless every drop of blood that has been spilled for Jerusalem, which is clean and pure blood, blood spilled for Allah, Allah willing. Every martyr (Shahid) will reach Paradise, and everyone wounded will be rewarded by Allah," Abbas said in a speech, segments of which were aired on official PA TV and posted on his website. "Today the world is divided between those trying to undermine religious coexistence and those trying to protect it," Israel's Foreign Ministry Director General Dore Gold said in a statement Thursday. "By saying that the 'filthy feet' of Jewish visitors to the Temple Mount desecrate it, Mahmoud Abbas has now clarified on which side he stands." Relative quiet returned to the Temple Mount on Wednesday, after three days of violent confrontations between Muslims and Israeli authorities during the Jewish New Year. Acting Police Commissioner Bentzi Sau ordered hundreds of Israeli security personnel to Jerusalem to restore calm in light of "an upsurge" in attacks, such as firebombs and stone-throwing targeting Israeli police and civilians. On Sunday, Palestinians throwing stones killed an Israeli civilian – 64-year-old Alexander Levlovitz – after he lost control of his car and crashed into a lamppost in Jerusalem's East Talpiot neighborhood. A comment like this from the leader of any non-Muslim country or territory would be all over the media. But people have come to expect juvenile talk like this from the Muslim world and they either ignore it or turn it around so it's somebody else's fault. Muslims are now the beneficiary of the rest of the world's lowered expectations and de facto victim status. Our British Prime Minister, fully supported by his honourable cabinet and the majority of both houses, has emphasised that Islam is a religion of peace. It is a truthful religion, except when seeking to deceive on behalf of Allah, the Lord of Peace and Mercy, blessed be his name. I'm sure the Investigative Project must have just got a few of its facts wrong. Surely the venerable International Union of Muslim Scholars would not lie and provoke violence in the manner of their accusers? I mean being members of a religion devoted to peace and truth and all. is this the language and tone a moderate Palestinian leader uses to promote the 2 state solution?????? ?